Off of the kitchen, the new screened-in porch leads to a brick patio and outdoor shower. 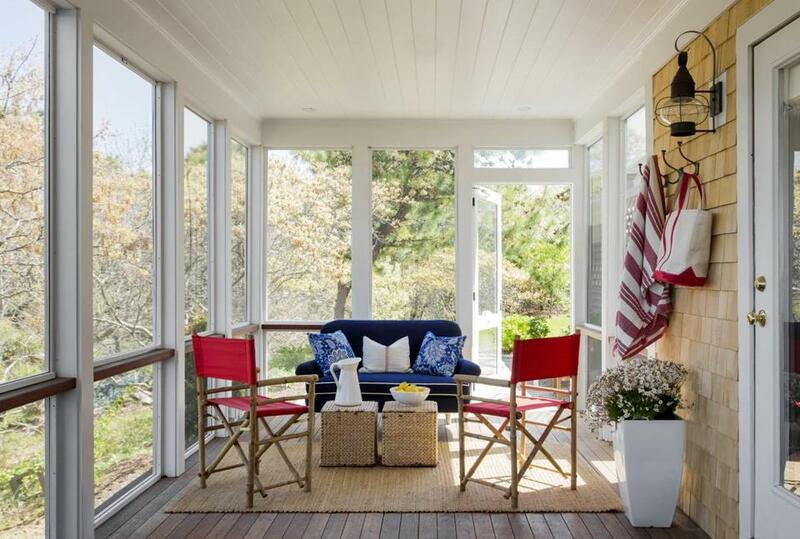 Sited on a cul-de-sac off the beaten path, the location of this Outer Cape house with glimpses of the ocean was an ideal retreat for the homeowners, a family of four. 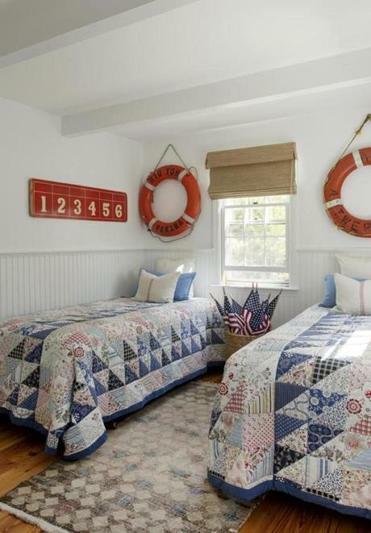 While the location was perfect, there were a few things that needed to be done to the 1950s Cape Cod-style house to comfortably accommodate the active family, their dogs, and frequent guests, says Kelly McGuill, a Walpole-based interior designer and stylist. “Rooms were small and disconnected from one another so walls were removed to create more airy spaces,” says McGuill, who worked with architect Peter MacDonald to tailor the home to the family’s needs. New wide-plank floors were laid and bead board was added to walls. The home’s aesthetics are simple: Walls are painted bright white, and red, blue, and black accents provide comfortable contrast. A large screened-in porch off the back of the house was an integral part of the renovation. With different seating areas and a dining table at one end, the porch provides nearly as much area as the entire first floor of the house. In the event that the weather isn’t conducive to outdoor lounging, there’s plenty of space to relax indoors. Drawing on her own experience summering on Cape Cod in her youth, McGuill suggested turning the formal living room into a casual gathering place with a custom 8-foot long table. “I have memories of everyone gathering around a big table and talking and eating for hours,” she recalls. It seems certain that the homeowners will have similar memories of their own. Off of the kitchen, the new screened-in porch leads to a brick patio and outdoor shower. The sofa is upholstered in a L.L. Bean performance fabric that is fade- and stain-resistant; the red directors chairs, purchased at a local store, have similar fabric. “The durability of performance fabric is amazing,” says McGuill. “It will stand the test of time.” A sisal rug from Pottery Barn is equally durable. Sand, says McGuill, just disappears in it. The quilts in one of the four bedrooms are from Ikea. The vintage life preservers and game board on the wall were Brimfield Antique Show finds. A weathered antique oushak rug adds a bit of decorative flair to the floor. Baskets throughout the house add texture while offering places to put things away. The formal living room was transformed into a casual place to hang out. “The room wouldn’t have gotten much use as a living room,” says McGuill. “Now it’s a place to come together when the weather’s bad to play cards, to do crafts, to eat breakfast.” The oak table, bench, and black Windsor chairs were custom made by Craftsman Tables. An antique plate rack displays little finds from the beach and on another wall, vintage shell prints are encased in white Ikea frames.